Vice Chancellor of OAU, Professor Eyitope Ogunbodede, disclosed this to reporters after the meeting of the Council on Wednesday in Ile Ife, Osun State. 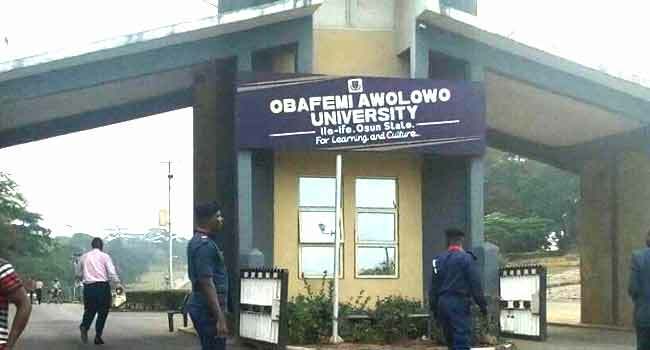 He revealed that the Council, after its findings, concluded that Professor Akindele had an inappropriate relationship with one of his students, Miss Monica Osagie, a claim to which he admitted. The Council also discovered that the don had offered to change Osagie’s 33 per cent result to a pass mark, in consideration for sexual favours. According to the vice chancellor, this was established in an audio recording that went viral in early April which Akindele also admitted to. He informed journalists that from the evidence, Miss Osagie had no idea that she scored 45 per cent pass mark as claimed by the erring professor, although the student later found out she did not fail the course. Professor Ogunbodede noted that the Council, from all findings, found out that Professor Akindele operated in a position of power and authority over Miss Osagie and as such sexually harassed her. He added that Professor Akindele was found to be liable for all allegations of misconduct levelled against him with all the evidence at the Council’s disposal. The VC pointed out that this led to the dismissal of the academic from the services of the university, to serve as a deterrent to others. He disclosed further that the university has taken further steps to ensure total elimination of sexual harassment in the OAU community. According to Ogunbodede, the institution has a legal duty to prevent sexual and gender-based harassment within the school and to ensure that both men and women are protected from the menace. To achieve this, he said the university has put a strategic implementation framework for sexual harassment policy in place. The vice chancellor explained that this would ensure effective and rapid redress mechanisms to incidents of sexual harassment, just as a whistleblower policy is also being developed by the university.